Make every moment special and never let a day be forgotten. ArtCarved has thrived on this principal and designs piece with this idea in mind. Celebrate both life’s greatest and smallest achievements with a piece from this long-recognized designer. In the 1920s, ArtCarved became a reality, crafting pieces with exquisitely carved designs and extreme attention to detail. This bridal jewelry brand carries both wedding bands and engagement rings to fit any style and look. Crafted with the same passion and love you hold for your significant other. With their strong commitment to protecting the environment and helping empower the people from where they get their materials, their pieces are not only extremely beautiful pieces of art, but also a great way to honor the people and the Earth. 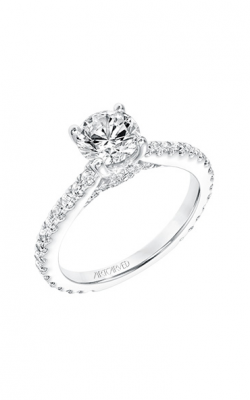 ArtCarved engagement rings come in three stunning and beautiful collections. 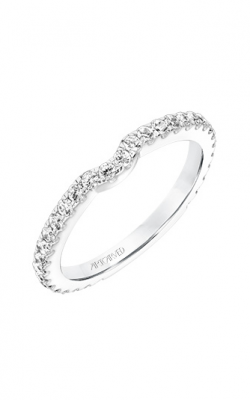 Each collection boasts pieces that are both elegantly designed and carefully made. The engagement rings found in the Classic Collection are timeless pieces, always in fashion and luxurious by design. In this collection you will find intricate solitaire pieces, inspiring side stone rings, and diamond studded halo settings. For a more modern look, the Contemporary Collection of engagement rings feature modern shapes with intertwining shanks and ropelike details. Some of these pieces even feature mixed metals in their awe-inspiring metal-work. For some intricate details in the ring band, fashionistas turn to the Vintage Collection with their magnificent art deco styling. After the engagement, celebrate your union with an ArtCarved wedding band, with designs for both men and women. To accompany your Classic, Contemporary, or Vintage engagement ring, you can find a Classic, Contemporary, or Vintage wedding band to accompany it. These wedding bands come in a multitude of styles and metal types, from rose gold, to white gold, to yellow gold, with some bands holding precious stones in stunning channel, pave, and prong settings. ArtCarved’s mens wedding bands come in a few additional collections. Why Shop for ArtCarved at Long Jewelers? Based out of Virginia Beach, Virginia, and a longtime member of the Museum of Named Diamonds, Long Jewelers has been leaving its mark in the luxury jewelry industry for over 30 years. We are a luxury retailer of designer wedding bands, engagement rings, Swiss timepieces, and fine jewelry items serving the local communities of Norfolk, Virginia Beach, and Chesapeake, and the Greater Hampton Roads and Tidewater area. Our professionally trained and experienced staff is here to help you make the right decision and find the jewelry piece you or your loved one has always dreamt of. Our onsite jewelry repair and jewelry services make us your one-stop shop for all things in fashion and bridal jewelry. Check out or stunning showroom for jewelry and bridal pieces and speak to an expert on ArtCarved and more at Long Jewelers.